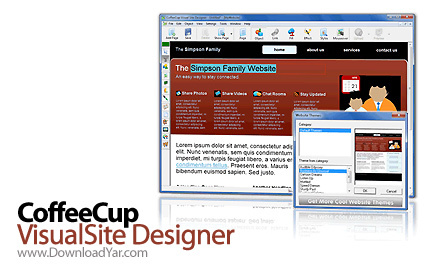 CoffeeCup VisualSite Designer نرم افزاری برای طراحی و ویرایش وبسایت بر مبنای استاندارد WYSIWYG می باشد که برای شما این امکان را فراهم می آورد تا بتوانید صفحات وب را بدون نیاز به داشتن دانش و تجربه در زمینه HTML ایجاد و ویرایش نمایید. تنها کاری که نیاز است انجام دهید این است که تصاویر و متون مورد نظر خودرا با استفاده از قابلیت drag & drop ، در صفحه وب خود وارد نمایید و سپس آن رابرروی وبسایت خود آپلود نمایید. CoffeeCup VisualSite Designer با بیش از ۷۰ قالب صفحه وب این امکان را به شما میدهد تا بتوانید کار خودرا شروع نموده و بتوانید وبسایت خود را با صفحات متعدد، فیلدهای متنی، گرافیک وتصویر، انیمیشن و غیره بسازید. میتوانید با بکارگیری این نرم افزار، صفحات خود را با استفاده از تصاویر خود ایجاد نموده و یا از دکمه های گنجانده شده در نرم افزار و ایجاد کننده های پس زمینه برای هر مرحله از کار استفاده نمایید. Create pages with your own images or use the built-in button and background creators to make every step a breeze. The program has its own image creation tools so you don't need other graphics software. When you are happy with your page, upload it to your Website with just one click ... the built in FTP function handles the rest. The software puts all your pages and images online for you, practically eliminating broken links and missing images. If you can use a mouse you can make your own Website. All you need is CoffeeCup VisualSite Designer, and nothing more ! Now Anyone Can Make a Website ... No Experience Needed ! - VisualSite Designer is based on drag-and-drop functionality. If you can point and click, you can make your website! True WYSIWYG Layout & Design. - With the Add Page, Remove Page and Show Page buttons you can: insert new pages into your website, remove a page or show existing pages that are currently hidden. - Adding images is a snap! Just click on the Image Icon, then click on where you want the image to go. After you pick your image it appears right where you clicked (you can always drag it to a new spot). - Use the Built in FTP tool to Send your website to your host. - Use the HTML button to insert Flash code into your website. - Add Visual Effects to your Text and Images like Drop Shadows and Styles. - Mouseovers are just one click away in VisualSite Designer. No more tricky scripts or complex image editors. - Look no further, Over 50 Page Backgrounds. - The Toolbar puts all the editing tools at your fingertips. Switching between functions is as easy as point and click. - The Page, Object, Link, Fill, Effect and Styles buttons controls the content of the Inspector menu.